Stocking stuffer ideas for kids can sometimes be difficult to come by – especially finding things that they will actually use! You’ll love these ideas, and they all cost less than $10. The stocking tradition is very dear to my heart. To me, it’s just not Christmas without a stocking brimming with stocking stuffers galore! “Santa” used to wrap each and every one of the gifts in my stocking, which made Christmas morning even more fun (and made the festivities last longer). We used to put our stockings at the foot of our beds on Christmas Eve, and the next morning wake to its overflowing goodness. As a parent, however, I have gained a new perspective on stocking stuffers. Man, those things can add up! And many times, they’re just trinkets that are forgotten about as soon as the big presents are opened. Let’s take a new approach to the Christmas stocking, and fill it with stuff your kids will actually use on a regular basis. Not only are these gifts functional, they are fun as well. You’ll feel good about the money you spend, and your kids will be happy too. My son Gabriel loves to drink “grown-up” tea in a mug. Any kind of cute cup with your child’s specific tastes in mind will be special to them. I also love these emoji cups – too cute! Fill it with your child’s favorite treat or candy to make it even more festive. These kids’ beanies are adorable and have lots of bang for your buck! If you’re like me, you might want to get several. It seems like I lose my kids’ hats just about the time it gets really cold. This is such a cool idea. 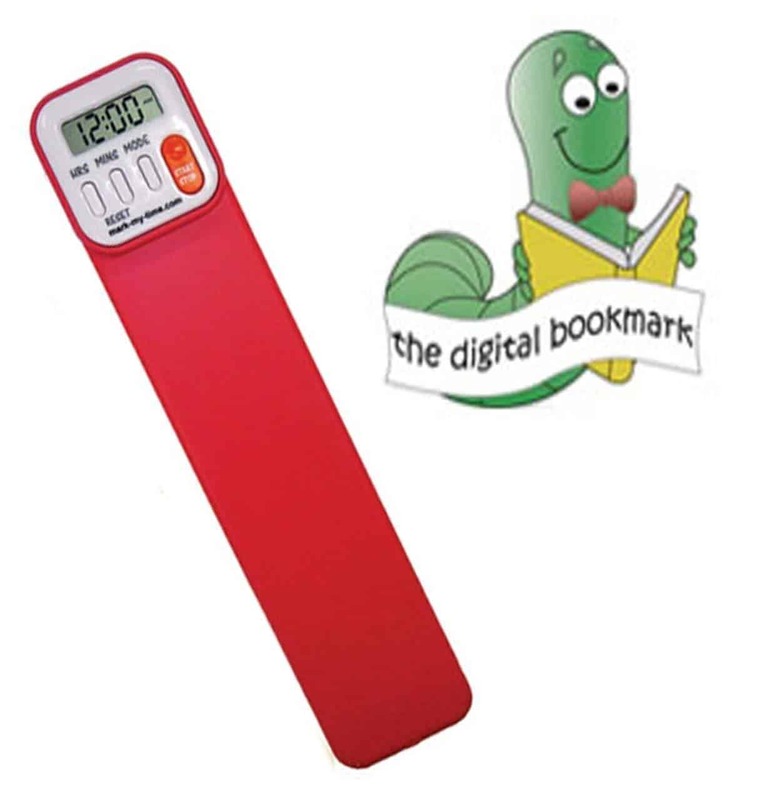 This nifty bookmark timer keeps track of how long your child has been reading. Especially useful for kids who need to do required reading time each day. It’s ultra slim and is powered by a replaceable watch battery, and it comes in several cute colors. It includes a countdown timer (alarm for required reading) or cumulative time (to record reading time over several sessions). Can also be used for any other timing needs, from homework to piano practice. This is a traditional stocking stuffer my parents gave us every year. It was nice because, unlike the handmade ornaments that parents want to keep, we had a collection to take with us when we moved away. The nostalgia provided by these ornaments is a cozy reminder of childhood. There are loads to choose from on Amazon, and these 3-D buildable puzzle ones are like two gifts in one! I know, it sounds boring, but can you think of anything more useful? We are forever losing my kids socks, and always needing new undies because of growth spurts. Actually, I think it’s quite fun to get these as gifts, especially if they are cute colors. Try getting some underwear with your kids’ favorite characters, and socks that are all the same color to make matching easier. Great quality and a good way to stock up for next year! A journal, whether for drawing or writing, is always a good idea. 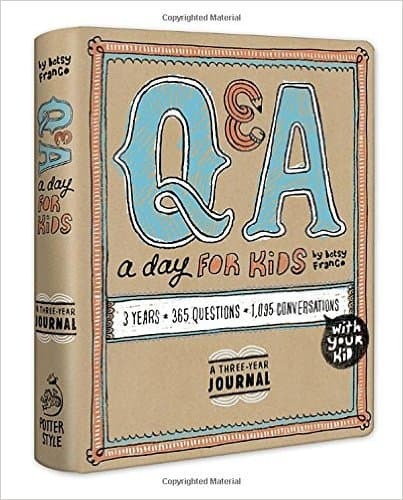 I LOVE this Q & A a Day for Kids journal – it spans 3 years of questions and short responses which records your child’s changing ideas and thoughts in a simple and beautiful way. If your kids are really young, you can write down what they say until they are old enough to write. (Ok, the price on this has now changed to $11 – but I still think it’s a great deal). I had SO MUCH FUN playing with this classic magic 8-ball toy as a child. We used to spend hours asking it questions and laughing at the responses. In our family, it seems like toothbrushes and socks are cousins – they always go missing. An extra one in the stocking will be put to good use! I especially like the RADIUS Totz brand – they are 100% BPA, Latex, Lead, Phthalate free. I want to start keeping toothbrushes in the kitchen and bathrooms so it’s easier to remember to brush both morning and night. A good alternative to candy in the stocking, eh? Playing card games is one of our favorite family activities. UNO (check out this fun emoji version) and Go Fish are perfect for little ones, and great for those long holiday car trips, too. I really like this Melissa & Doug set which includes a 3-pack set of Old Maid, Go Fish, and Rummy. This year I’m going to grab this classic wooden peg game – my oldest LOVES to play this at Craker Barrel. Kids are gonna get boo-boos. Might as well make it a *little* more fun with character band aids. Gotta buy ’em, anyway – might as well put them in stockings! Since we have nutritious smoothies almost every morning for breakfast, its much less messy when we have straws on hand. These silicon straws are great and are specifically made for extra-thick smoothies and shakes. You kids will love the colors, too! Or if you prefer, try these stainless steel ones. We always keep a blank notebook and crayons in our church bag to keep our kids quiet and busy. These seem to go missing or get used up quite quickly, so its a great idea to replace them. Nothing like nice new sharpened crayons! I also like using blank notebooks instead of coloring books to foster imagination. Silly putty and play-doh are great go-to items also. 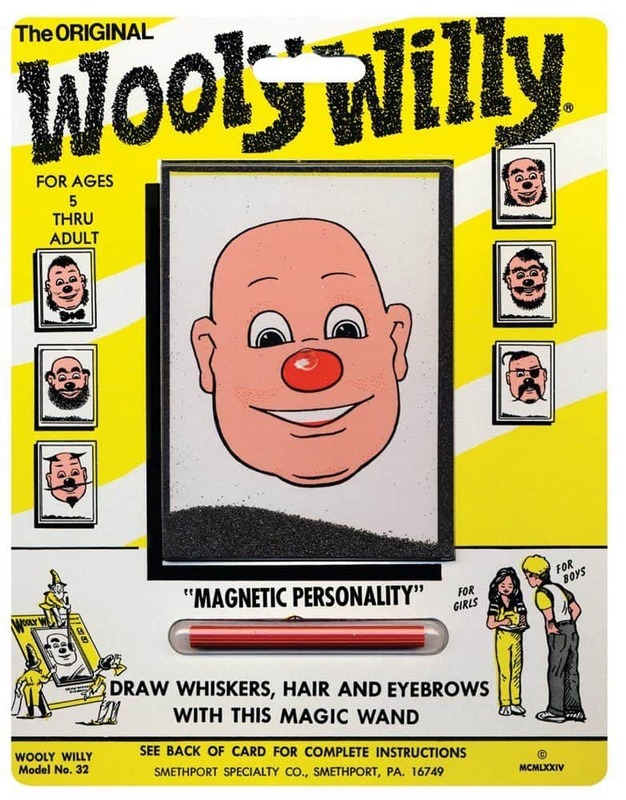 This Wooly Willy toy/game is so cute and creative. I have lots of memories of paying with this in church as a kid. Need I say more?? Glow sticks are magical and every kid loves them. No brainer. Bubbles, Sidewalk Chalk, and Water Balloons are classics you can’t go wrong with! Plus, you’ll be able to make tons of memories with them and have something to look forward to when the weather starts to thaw. One great idea is to add to your holiday book collection. 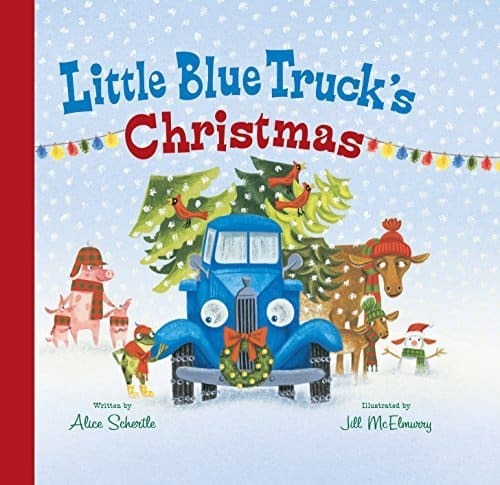 I love the Little Blue Truck series, but there are tons of cute Christmas books to choose from on Amazon. There is no better gift than reading with your child. More inexpensive and special than a movie! And now for the BEST stocking stuffer idea from one of our readers…. I hope these stocking stuffer ideas have been helpful. Do you have any to add to this list? Comment below! Awwww! What a fantastic idea! I’m going to add this idea to the post! Thanks! Sometimes We the children gave love coupons for Father’s a Day and Mother’s Day. Just added the idea! It’s perfect- free but so meaningful.